I like to brine my Turkey because it's my belief that brining makes it moist. The salt causes the meat tissues to absorb water and flavorings and breaks down the proteins, resulting in a tender turkey. This means that despite the moisture loss during roasting and the long cooking time, you still end up with a juicy bird. It's important to find a container that's large enough to submerge the turkey, yet small enough to fit in your refrigerator. Try a stock pot or a bucket. You can also purchase brining bags, like I did, and use the roasting pan, but you'll need to turn the bird periodically so that each side rests in the brine. 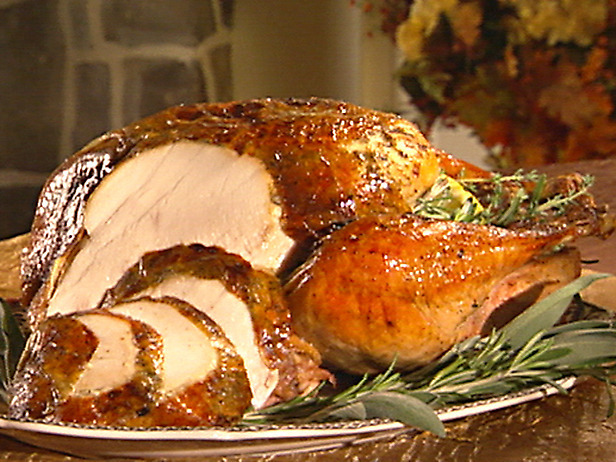 The basic ratio for turkey brine is two cups of kosher salt to two gallons of water. Some recipes include sweeteners or acidic ingredients to balance the saltiness. I have a tried and tested recipe that is full of flavor and I use every year to rave reviews! This makes about 2 cups. Add this to 1 gallon boiling water and stir until solids are dissolved. Cool to room temperature then refrigerate to chill. Using a large bucket or brining bag, place thawed Turkey breast side down in brine with an additional gallon of water to fully submerge. Chill for 12 -24 hours. Remove bird from brine, rinse and pat dry. Now it’s ready to roast. Tuck the wing tips behind the back and place the bird, breast side up on the roasting rack. I like to rub my bird with a bit of olive oil then pepper the skin, add fresh herbs to the cavity and tie the legs together. Follow the roasting instructions for your size Turkey. Remember that the turkey has already absorbed a significant amount of salt and any drippings that you use for gravy will already be salty, so taste before you add any additional salt. I too brine my turkey. I use maple syrup instead of the sugar. It gives the skin a brawnzy color after cooking. Thanks for sharing this recipe with us. I have recently been turned on to the benefits of brining, so I am glad you posted this. What is it that most people don't like about turkey-dryness. Your brine recipe will really help in that area. thanks for sharing. I've never brined a turkey but am not against it. I like trying different ways of cooking the bird so I'll definitely need to give this a go. Cool! I have been a fan of brining for a few years now so I love this! I'm taking this to the TV next week and will have a segment about brining on KEYE-TV! Woohoo!